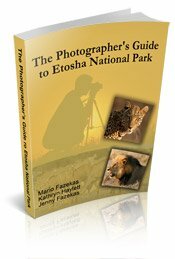 All these photographs were from a wonderful six day trip to Etosha. We spent three days at Halali camp and three days at Okaukuejo camp. The photos go to show that you don't need to spend months in a national park to get good photographs - but you do need to know when to go, where to look and how to use your photo equipment. Click on each Gallery thumbnail for a larger picture. The Fort in Namutoni camp makes a very appealing landscape. Salvadora waterhole is much favored by animals, especially zebras. Salvadora waterhole is most scenic and lends itself to impressive landscapes. 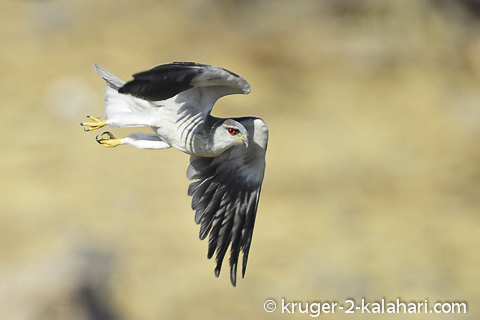 Halali camp is one of the best places in Etosha to find and photograph owls. This mantid was on a tree in front of our room in Halali. When it's too hot to be out game driving we are looking for subjects within the camps! This white-faced scops owl was photographed flying out of her nest in an acacia tree in Halali camp. This lioness drank at Moringa waterhole, at Halali camp, and then rested there for an hour until elephants chased her off - so much for our anticipation of seeing a kill that night! Black-faced Impala are found only in Etosha and they are seen mainly in the Halali area. Moringa waterhole at Halali camp must be the best place in Etosha to see leopards. 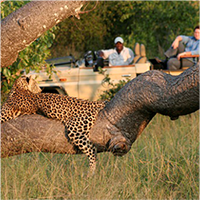 If you have patience and are prepared to sit at Moringa waterhole you are almost guaranteed a leopard sighting! Elephants fighting at Nebrownii waterhole near Okaukuejo. Okaukuejo waterhole is the place to photograph giraffe silhouettes. Every morning in winter, black-backed jackals would try to catch doves that were drinking. We were fortunate to get this picture as the jackals move very quickly! Just after the sun has set and the flood-lights come on the lighting is perfect to get some photographs with atmosphere - especially if there are some large animlas such as elephants and giraffe drinking! Male lion drinking at Okaukuejo waterhole. The floodlights had malfunctioned so we were lucky to have brought our one million candle power Lightforce light with us - otherwise we, and many other tourists, would not have these pictures! The lion, after drinking, went and lay in ambush and then caught a springbok that was coming to drink at Okaukuejo waterhole! At both Okaukuejo and Halali waterholes, every night tends to be a rhino show. This black rhino entertained us for a few hours. In all our visits to Etosha this is the only white rhino we have seen at night. She was drinking with her calf at Okaukuejo waterhole. These two black rhinos were very wary of each other. The mornings at Okaukuejo waterhole provide perfect lighting for animals, such as this Gemsbok, that come down to drink. 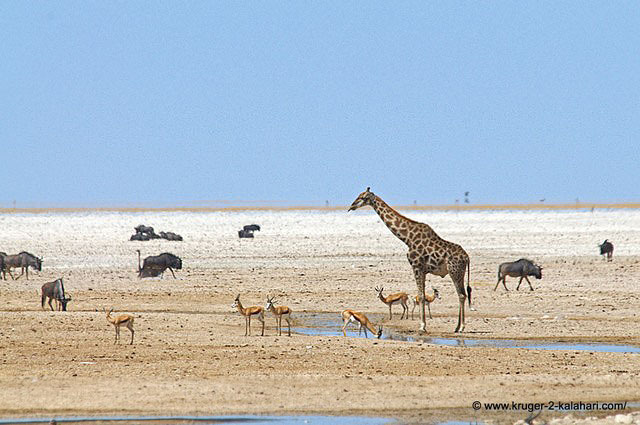 Many animals walk into the waterhole to cool down while drinking at the same time. This springbok was photographed at Okaukuejo waterhole. Zebras can be quite comical - the only problem is knowing which zebra to focus on as the herds that come down to drink at Okaukuejo can be large. This hyena was photographed at Okaukuejo waterhole before the sun had risen. In the afternoons Okaukuejo waterhole can still provide good photograph opportunities such as this back-lit giraffe. When the elephants come down to drink all other animals make way! The pride of lions at Okondeka waterhole tend to be very active. 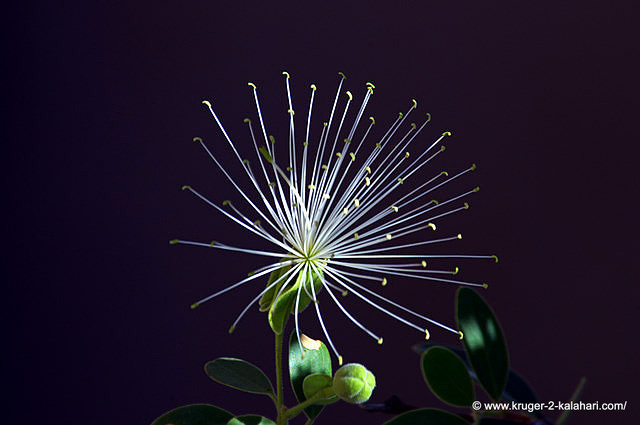 This flower from the Ringwood tree was photographed in Okaukuejo camp. In the winter months many animals congregate out on the pans and these make for good photographs with the white and blue backdrop and no trees to obscure the animals. The Moringa waterhole at Halali camp has a covered terrace where visitors can sit and watch animals coming down to drink. 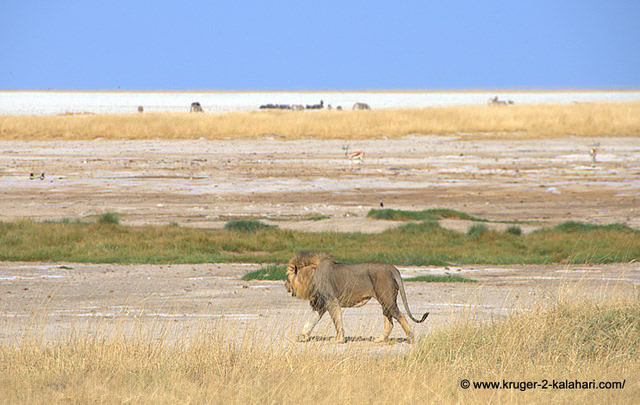 Did you enjoy this Etosha Gallery? 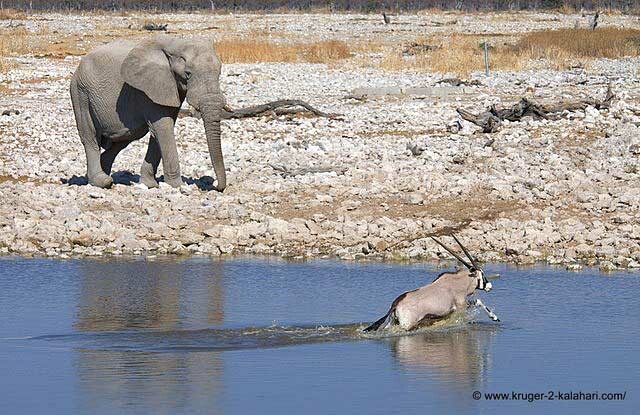 Have You captured any magical 'Etosha moments’? Photographs freeze these moments and allow you to share them with others. Many visitors to Big-5 game reserves take hundreds of great animal pictures but then never look at them or share them – they remain on a computer or CD for the rest of their days – what a waste!! Keep in mind that we have sold some of our photographs just by displaying them on this website. This is how it tends to go - we get an email from a publisher saying that they have seen one of our photographs that they would like to use in their next magazine and they are prepared to pay us US$175,00 for the photograph!